Yellow avens is native to temperate regions of eastern Eur­ope, Asia, and North America. It inhabits forests, wood­lands, swamps, fields, roadsides, trail edges, and stream banks, and prefers moist soil, such as meadows, open woods, thickets, and swamps. Plants: Plants are perennials, with stout, hairy stems, 12-39" (30-100 cm) tall. Leaves: Alternate, compound. Basal leaves are compound, while more upper leaves are variously shaped, roughly triangular or egg-shaped. Leaves are up to 4½" (11 cm) × 3½" (8.9 cm), coarsely toothed, and hairy. Stipules, or tiny leaflets, are often visible at leaf axils. Flowers: In groups of 1-5 at the end of branching stems. Flowers are ½-1" (1.3-2.5 cm) around, with 5 yellow petals that are round to oval, and may have a dull point or notch at the tip. Between the petals are five sharp-tipped sepals in the shape of a star, though these fold back as the flower ages. The sepals are equal to or shorter than the petals in length. Many yellow-tipped stamens surround a greenish center of many carpels. Flowers appear from May-July. Fruits: A velcro-like ball of tiny hooks, ¹/₁₆-⅛" (2.5-5 mm). Plant Perennials, with stout, hairy stems, 12-39" (30-100 cm) tall. 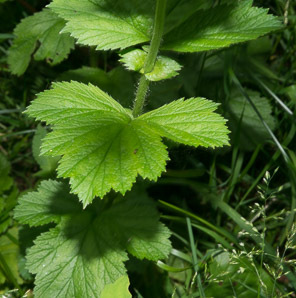 Perennials, with stout, hairy stems, 12-39" (30-100 cm) tall. Flowers In groups of 1-5 at the end of branching stems. Flowers are ½-1" (1.3-2.5 cm) around, with 5 yellow petals that are round to oval, and may have a dull point or notch at the tip. Between the petals are five sharp-tipped sepals in the shape of a star, though these fold back as the flower ages. The sepals are equal to or shorter than the petals in length. Many yellow-tipped stamens surround a greenish center of many carpels. Flowers appear from May-July. Flowers are ¼-½" (6.3-12 mm) around, yellow, with sepals interspersed between petals in a starlike shape. Petals may have a dull point or notch at the tips. 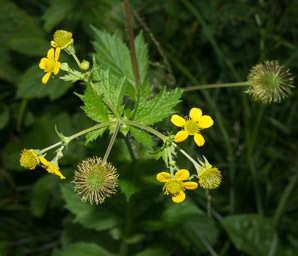 The sepals are shorter than the petals, and often curled back against the stem. There are many yellow-tipped stamens, and a greenish center of carpels. Flowers appear from May to early August. Leaves Alternate, compound. Basal leaves are compound, while more upper leaves are variously shaped, roughly triangular or egg-shaped. Leaves are up to 4½" (11 cm) × 3½" (8.9 cm), coarsely toothed, and hairy. Stipules, or tiny leaflets, are often visible at leaf axils. Simple or compound, usually alternate, and toothed. Basal leaves are on long stalks. 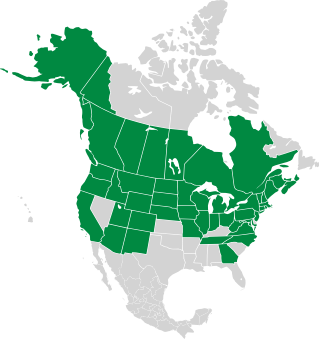 The terminal leaf is by far the largest, and it is heart or kidney-shaped, 2-4½" (5-11 cm) in size. Stem leaves are few, usually attached directly to the stem (sessile), and composed of three parts. Pairs of “mini-leaves” called stipules appear at leaf axils, and these are larger than in other avens. Fruit A velcro-like ball of tiny hooks, ¹/₁₆-⅛" (2.5-5 mm). A velcro-like ball of tiny hooks, ¹/₁₆-⅛" (2.5-5 mm), reddish in color. Habitats Forests, woodlands, swamps, fields, roadsides, trail edges, and stream banks. Prefers moist soil, such as meadows, open woods, thickets, and swamps. Otream banks, at edges of woods, and in moist meadows and thickets. 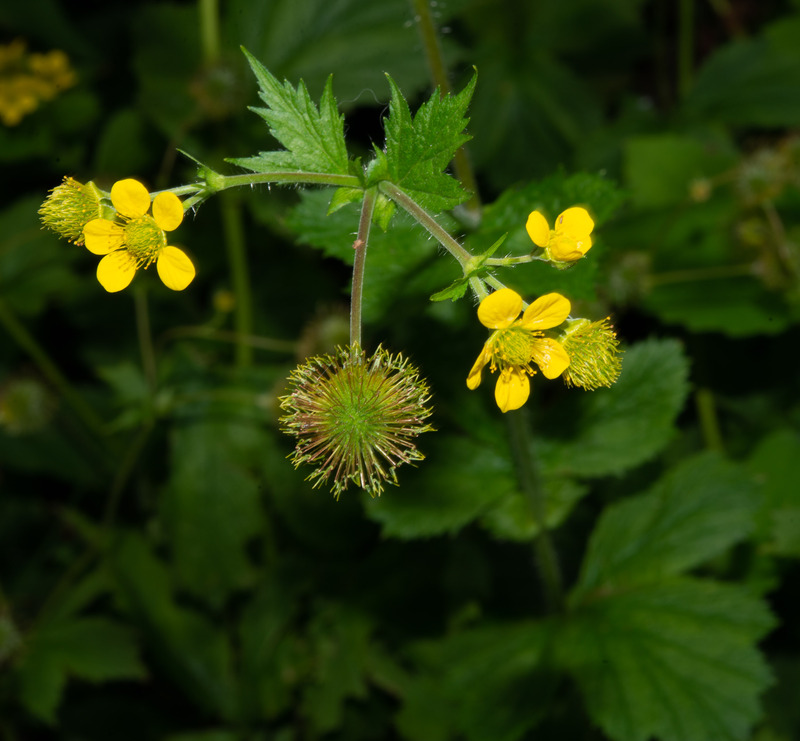 Geum aleppicum description by Thomas H. Kent, last updated 2 Jan 2019.